This waterproof cast protector will allow you to jump in the pool on a splintering hot summer day or simply take the shower you've been yearning for. The DRYPro™ waterproof cast cover is completely watertight, keeping your casts, bandages, and wounds dry. It is the only leg cast protection in the world with the patented vacuum seal to keep you dry. It is so protective, between the waterproof materials and the vacuum seal, that you can even dive off a diving board or ride the ocean waves and still have your cast or bandage stay completely dry! 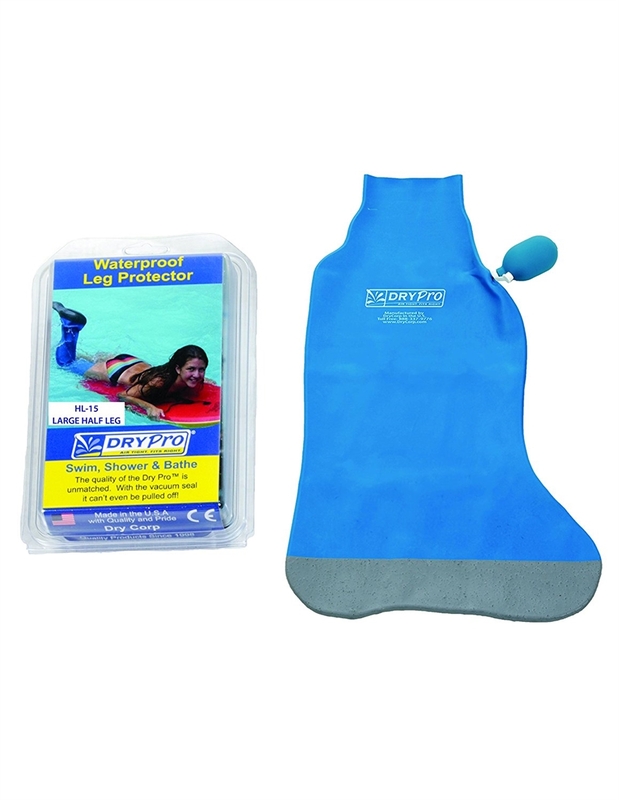 The DRYPro™ waterproof cast cover fits snug, yet comfortably, offering protection during any water activity. Unlike other products, the cast protection offered by the DRYPro™ waterproof cast cover is unmatched because it remains vacuum-sealed and in place, only removed when the seal is released by you. The DRYPro waterproof cover is also used for immediate postoperative physical therapy, allowing hydrotherapy right after surgery, which helps prevent swelling and stiffness and aids in a speedy recovery. All levels of physical therapy, including head NFL trainers, Major League teams and the collegiate level, use the DRYPro™. The DRYPro™ waterproof fabric is rugged and is made of durable high quality surgical latex. The special Non-Skid Grid™ protects the sole and helps prevent slipping during usage. The pump not only creates the vacuum seal but also works as a gauge showing that the vacuum is intact and cannot leak. So go ahead and ENJOY THE WATER! Applying hosiery over the cast will allow the cover to slide easily. If the cover is too long simply bunch up the extra material and pump out all the air. The extra latex will shrink down and conform to the shape of the users leg removing all extra length. Using Dry Pro™ products are as Easy as 1-2-3! 1. Slip it on: Stretch the Dry Pro™ over the arm cast (sometimes easier to put a sock/stocking on first). 2. Make the vacuum seal: Pump out the air using the removable hand pump that is included. 3. Take it off: Let the air back in by lifting the Dry Pro™ from the skin, releasing the vacuum seal and sliding it off. **It is IMPORTANT to following sizing instructions. Vacuum seal will not work unless the opening of the cover fits tight around the skin above the cast. © Copyright 2015 www.krutchpack.com. All Rights Reserved.